A trip to the Barossa Valley is not complete until you've visited Norm's Coolie dog show near Tanunda. Norm is still going strong with his not so funny sense of humour, giving all the kids in the audience a hard time. First part of the show was rounding up some sheep, the dogs were a little disorganised and it took quite some time and countless attempts for the dogs to get the sheep corraled. Eljay spent most of the show playing on the hay bales in the shed behind the paddock where the show is held. Norm also got the dogs to sit in a circle and bought the sheep in, then he got all the dogs to lie down togther in row. The show is set in a lovely rural setting and the property is dotted with old yellow utes and trucks that double as dog kennels, very Aussie. 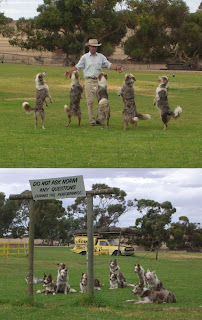 At the end of the show Norm got all the dogs to jump in the back of a yellow ute so the visitors could pat them, Eljay got up close but some of the dogs were pretty jumpy and snarling at the strangers. Norm's Coolie Dog Show sounds hilarious. Would love to see it! I recall the Wool shed Show in Cairns, performing sheep, also amusing.